BEST MOVIE THEATER: FREMONT THEATRE: Servicemen stationed at Camp San Luis Obispo and Camp Roberts joined comedians Stan Laurel and Oliver Hardy at the Fremont Theatre’s opening gala premiere in 1942. Since then, the theater’s faced closures and possible development plans but has continued showing films, hosting live acts, and staging live music. For 23 of the last 30 years, New Times readers have voted The Fremont as Best Movie Theater or Best Place to Escape to the Silver Screen. The gorgeous May weather and historic charm of the Village of Arroyo Grande definitely add to the Arroyo Grande Strawberry Festival experience. Arroyo Grande Mayor Jim Hill said, “We always look forward to the annual Strawberry Festival, highlighting our local strawberry growers. This year we will have more local vendors, especially in the arts and crafts area.” In addition, there are myriad food vendors, activities, and music. Above all, it’s about the strawberries! There’s the Strawberry Stampede Walk/Run, Strawberry Pancake Breakfast, Strawberry Shortcake and T-shirt booths, Strawberry Prince and Princess Contest, Strawberry Blonde Contest, and Strawberry Cook-Off Contest. Colorful musicians burst out of Colleen Gnos’ current paintings, but the fine artist, muralist, and sculptor has explored many things. In her 20s, she went from UC Santa Cruz to Italy’s L’Accademia di Belle Arti, an art school founded by some guy named Michelangelo. She’s designed the set for the La Jolla Playhouse’s production of Tartuffe and more than 90 wine labels for Kelsey See Canyon Vineyards. “I have a solo show at Steynberg Gallery in June, I’m this year’s featured artist for the Live Oak Music Festival, and I’ll be painting artwork on the lifeguard towers in Avila beach to be completed by November,” Gnos added. Known as SLOMA, this organization’s goal is to provide and promote diverse visual arts experiences for people of all ages and backgrounds. With a rotating series of art exhibits in three galleries; art classes for all ages and skill levels; and special events such as concerts, lectures, films, and discussion, SLOMA is the place to be for artists, patrons, and art lovers. “Adults seeking some peace and quiet, kids in art camps up to their elbows in art materials, grown-ups taking workshops to improve their skills and nurture their passion—it’s all here on any given day. The place is jumping! And engaging!” Executive Director Karen Kile said. 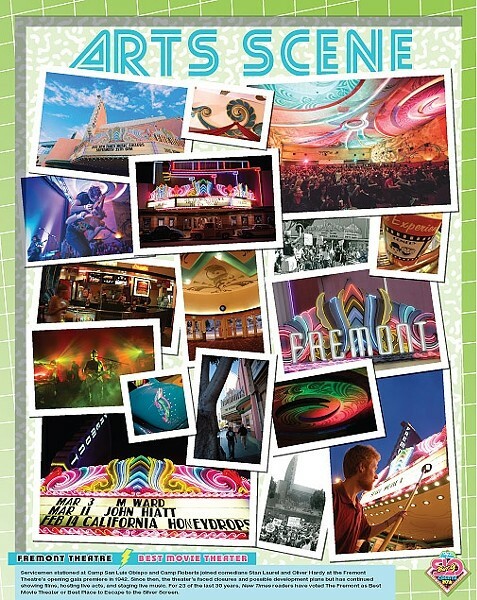 The historic Fremont Theatre opened its doors for the first time in 1942. It’s among the last of architect S. Charles Lee’s “Streamline Moderne” designs. Popular among the Camp San Luis troops on the eve of World War II and frequented by Hollywood’s elite, it was saved by public outcry when developers lobbied to raze the structure. In recent years it’s found a second life as a live theater, hosting popular music acts such as Los Lobos, Jeff Bridges, and Adam Ant, not to mention comics such as Russell Brand. Its interior grandeur, majestic marque, and old-school vibe makes it a perpetual favorite. Here’s to the next 74 years! Louie Ortega is best known nationally and internationally as a sideman (guitar and vocals) for Sir Douglas Quintet, and the Texas Tornados, the latter of which won a Grammy in 1990 for Ortega’s performance and translation of “Soy de San Luis” on their debut album. Locally, he’s known as a solo performer and essential member of acts such as CC Riders, Rio Salinas, and the band Ortega with his daughter Talia Ortega. He’s always got things cooking both locally and beyond. “I’d like thank everybody for their support, not only support for my music but for all the live music in the county,” said a grateful Ortega. There’s a view from every seat in this comfortable amphitheater. In just three years after opening, the Vina Robles venue took center stage as one of the largest outdoor entertainment areas on the Central Coast. Paired with its own winery that enables easy access to fine wine and cuisine, it’s a sweet spot to spend a Friday evening watching the summer sun set over some tunes. Many greats, from Weezer to Ringo Starr, have graced the stage singing under the starlit sky. Concert season runs until October, which leaves plenty of time for concertgoers to find their way to Paso Robles. The long-running farmers’ market has new plans to freshen up the market-turned-street-fair. It’s known as a hot spot for locals and passers-through to simultaneously shop for produce, eat barbecued ribs, and see some local entertainment, and the SLO Downtown Association has been busy scheming new ways to improve the ever-popular event. Those plans include free WiFi, reduced foot-traffic congestion, and an expanded market sections on Chorro Street. They’re also working to implement acceptance of the new electronically-based food stamp system for fresh produce, and you might even see beer and wine tasting come to the market later this summer.